All over the world, cities young and old are being refreshed with street art. Sometimes political, sometimes whimsical, street art is always about accessibility. Unlike museums, seeing street art is always free, making it perfect for budget travelers. 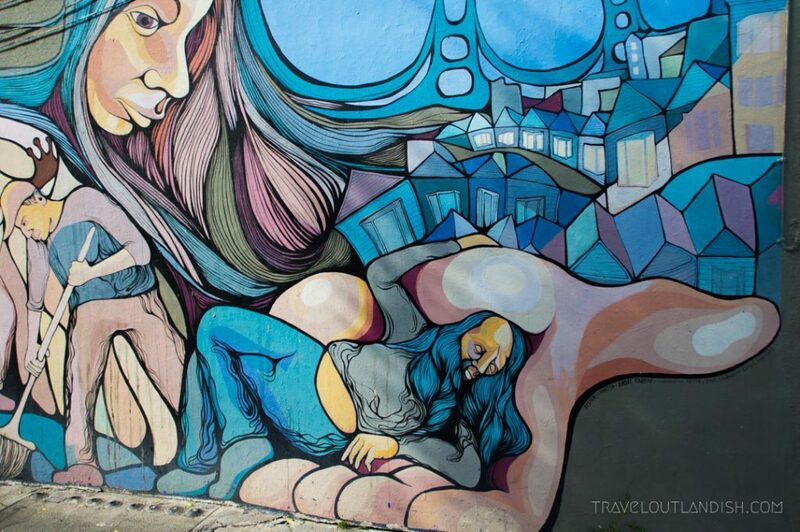 I asked travel bloggers to share with me some of their favorite street art around the world. I was so overwhelmed with the responses that I split it up into two posts: one focusing on worldwide street art and the other more specifically on street art in Europe. In this roundup, you’ll find street art from around the world – from Asia to Australia to the US and beyond. Stay tuned for next week’s post on street art in Europe! 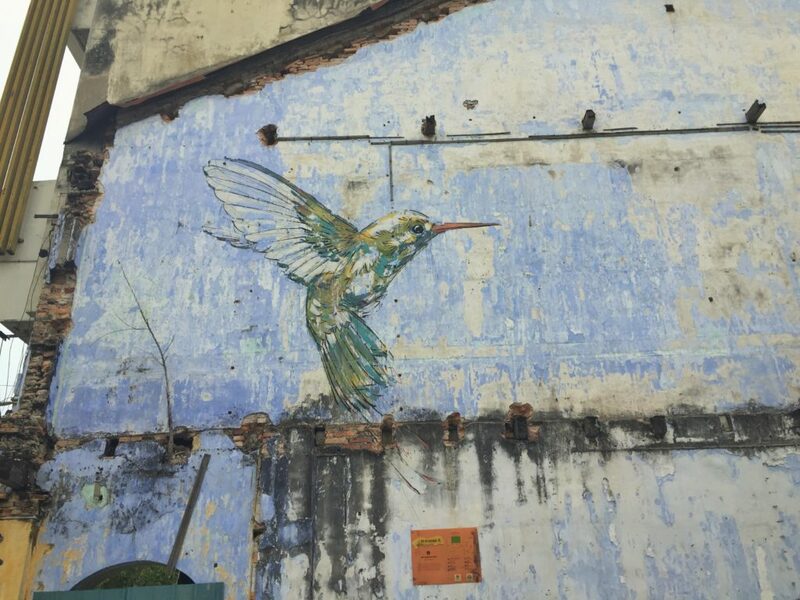 Two hours away from Penang and its well known street art by Ernest Zacharevic is Ipoh. Well known as a domestic tourist location, it doesn’t receive many international visitors compared to the Cameron Highlands or Penang. But if you enjoy street art, you should definitely investigate the pieces found around Ipoh’s Old Town. There are seven pieces by Ernest Zacharevic which form the mural art trail, but as you follow this trail you’ll stumble across over 20+ pieces from various artists. Many of the pieces symbolize the history of the city and the best part? It’s easy to get uninterrupted shots without hoards of tourists queuing up to have your picture taken (I’m looking at you, Penang). 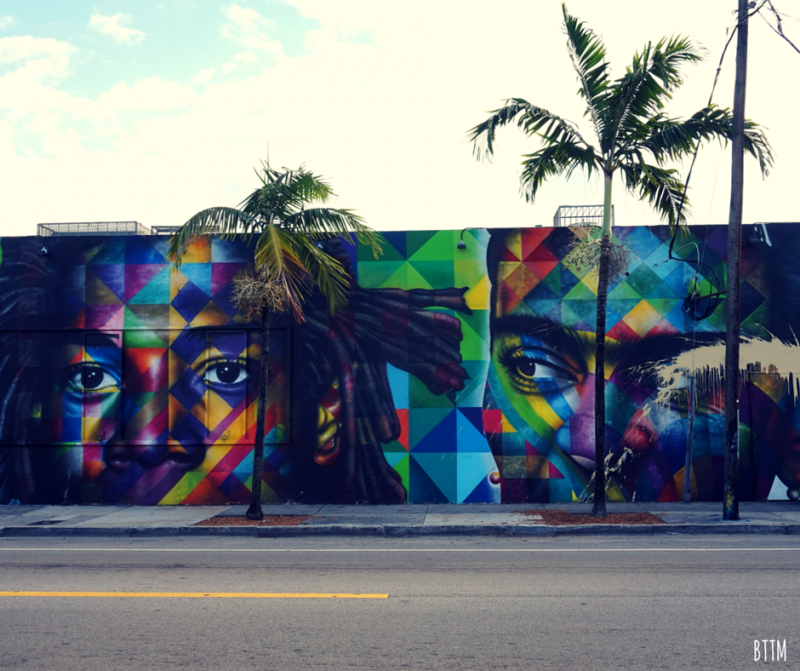 Wynwood is an area of Miami that is known for its street art. In reality, street art is what saved Wynwood. Less than 10 years ago, the area was a forgotten warehouse district. There were no shops or restaurants, and it wasn’t considered a safe neighborhood. Then in 2008, a man named Tony Goldman had artists from all over the world come and paint murals on the many properties he had bought out in Wynwood. Soon, people were flocking to the area. Fast forward and now Wynwood is considered one of the hottest neighborhoods in Miami, with eclectic bars and trendy restaurants. And, of course, awesome street art. What I love most about Wynwood is that the art is always changing; every visit means seeing something new. An especially great time to visit Wynwood is during Art Basel, a weeklong art fair that attracts over 70,000 people to Miami. During this time, many of the walls are repainted with really cool and fresh designs. Newtown, just a couple of kilometers from the center of Sydney, is a street art lover’s dream. The area boasts an incredible number of large murals thanks in part to the local government, who have over the years built good relationships with local artists through their Perfect Match program. The program pairs up local businesses and homeowners with artists. Almost every street in this suburb features some form of street art. My current favorite is this new mural called The Promise by Ox King. It is based on the character Miss Havisham from Charles Dickens’ book Great Expectations. He found his inspiration for the character from a local Newtown woman who lived just a short walk from this mural. Painted in just three days, I love the colors and that it brings the story of this local woman and classic literature back into the conversation. I recently took a Free Tours By Foot tour of Bedford Ave. in Brooklyn and discovered just a fraction of the fantastic work on the streets surrounding the Bedford Ave. subway station (L train line). There were so many world class murals here it was difficult to pick a favorite, but I think this one by Brasilian artist Eduardo Kobra called “The Fight for Street Art, Popular” is an important piece. 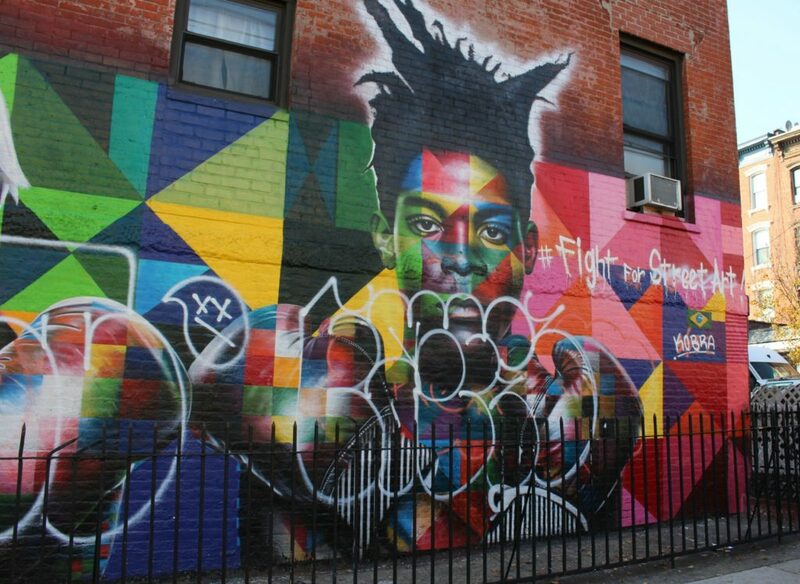 Featuring the images of artists Basquiat and Warhol, it questions if the street art movement in NYC is dying. You will find it at the corner of Bedford Avenue & North 9th Street in Williamsburg. Kobra’s work was recently commissioned for the Rio Olympics. Close to downtown, La Roma neighborhood is a good starting point to start uncovering the city’s main hotspots and one of the best places to visit in Mexico City. Boasting French influences and a pristine art-deco style, La Roma is a vibrant yet friendly district populated with tasteful street art, multidisciplinary buildings and galleries like Casa Lamm, as well as avant-garde restaurants that reinvent Mexican cuisine from its core and humble beginnings, such as Fonda Fina. Remember to bring a camera, you are going to need it! The street art in Cape Town can be seen on almost every corner. Each piece is beautiful and tells a story of the hardships that the South African people have faced. 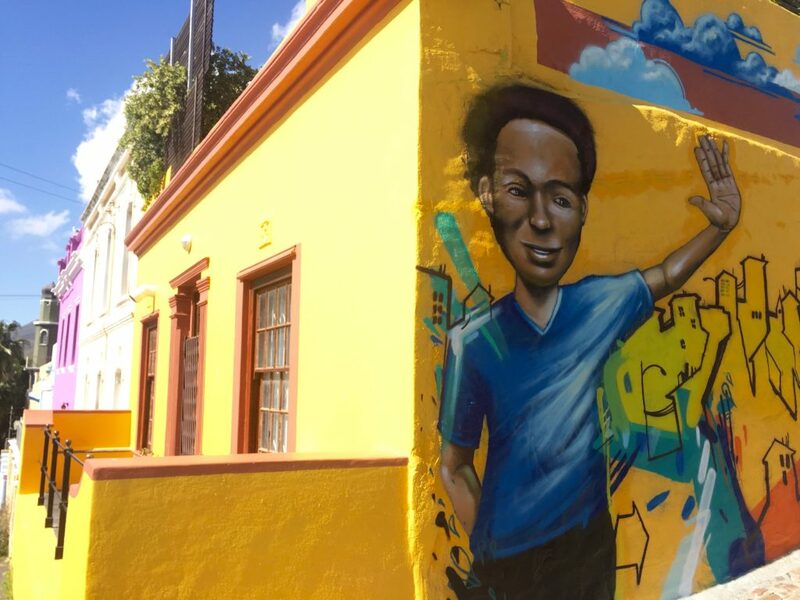 A particular area of Cape Town, called Woodstock, features so much street art that there is even a walking tour visitors can go on to ensure they see the best of the best! The art in Cape Town has been emerging for years and truly brings the community together as a whole. 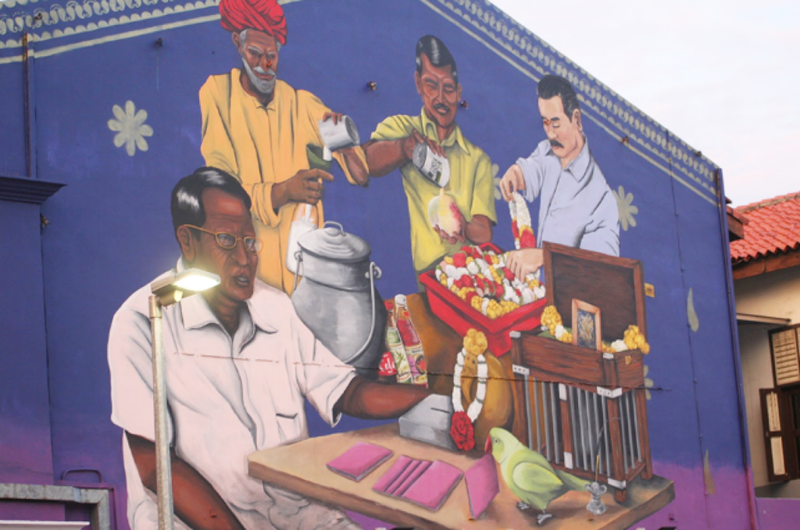 This massive piece can be found on Belilios Road in Little India, Singapore. It’s called Traditional Trades of Little India by a local artist named Psyfool. It always catches my eye because for one – it’s huge! It covers the side of a building and brightens up the whole area with its vibrant colors. The meaning behind it strikes a chord too, as it depicts the various sights and sounds of trade the locals are familiar with. In fact, you’ll probably see real life examples of them while roaming Little India! Truly a feast for the senses, it’s an area that can’t be missed! 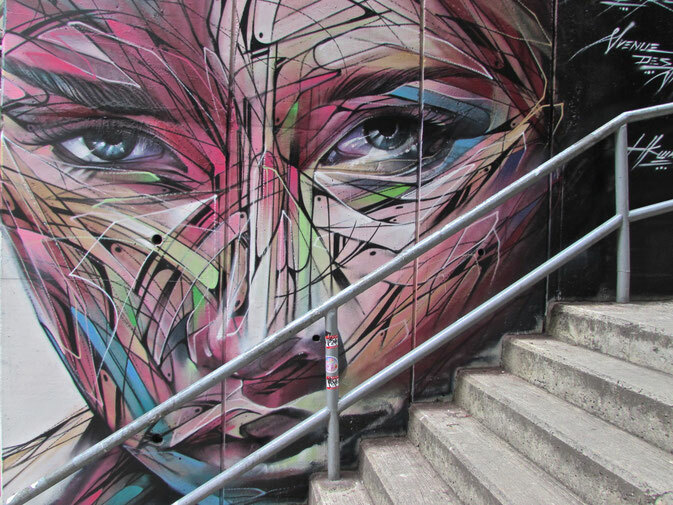 Auckland, New Zealand is a modern, trend-setting city that loves street art. The city council often sponsors local artists, providing them with a wall or other blank space and challenging them to be creative. Annually during art week, the city offers free walking tours focused on either street art, sculpture, cultural art or architecture. If you are looking for street art in Auckland, start with side roads and alleyways in the Central Business District (CBD). Then head up Queen Street to Karangahape Road (K-Road), where a recent competition brought some of the city’s top street artists together. The artwork around Auckland is colorful, vibrant, and energetic. This piece is from a temporary exhibit painted on former shipping containers and located just outside the city’s main ferry terminal at Queen’s Wharf. 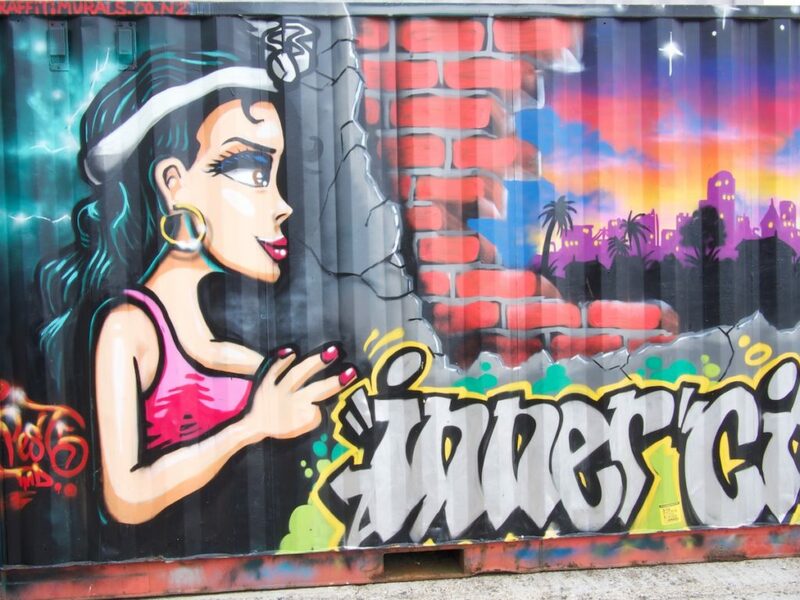 It is one of a series of spray-painted graffiti artworks by various artist, this one entitled “Inner City Life” by Jonny 4Higher. Street art in Austin, Texas. Photo credit Corey Mendez Photography. Street art lovers must make an effort to visit Austin, Texas. Not only is this city awash with talented art, but there is even a designated graffiti area just off the hipster South Congress street called Castle Hill. 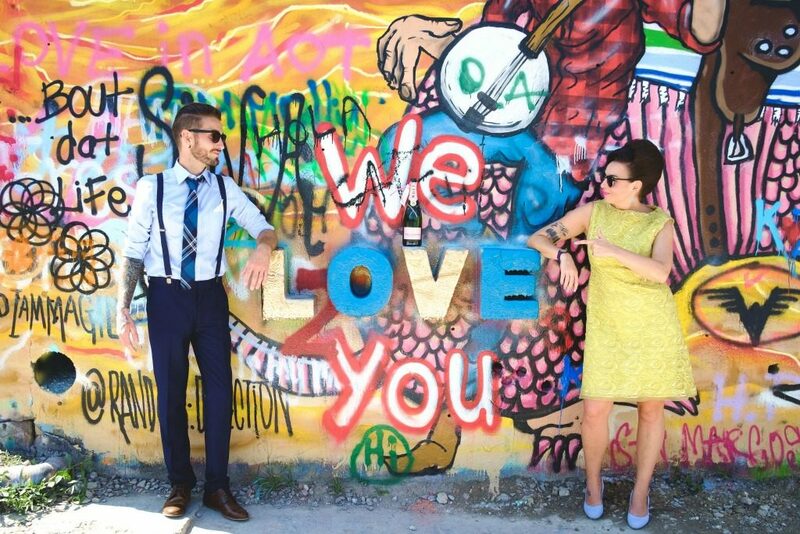 We loved it so much we went back the following year and used it as the backdrop to our Austin wedding elopement! Austin has so many iconic graffiti pieces such as the ‘I Love You So Much’ wall, ‘You’re My Butter Half’ and Daniel Johnston’s frog – ‘Jeremiah The Innocent’. Spotting street art is just one of the cool things to do in Austin, Texas! 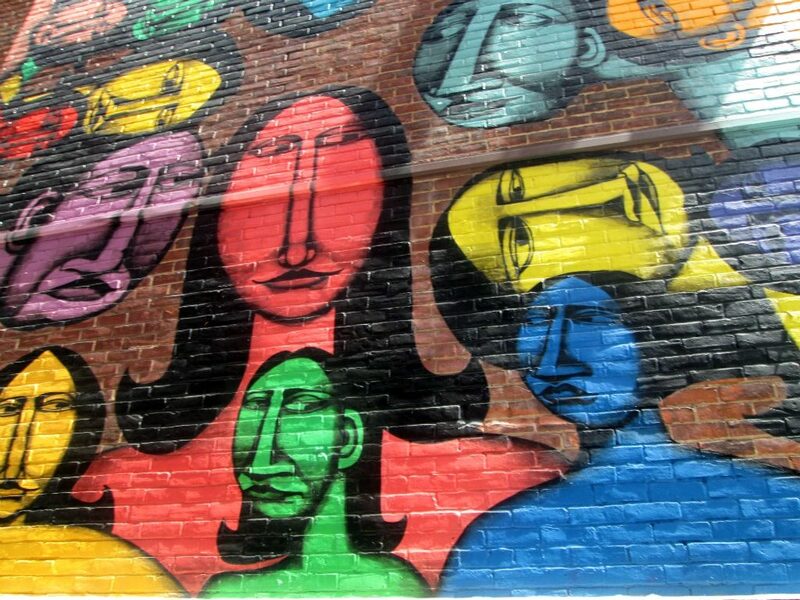 Street art in Montreal, Canada – check out my budget guide! I went to Montreal, Canada a few years ago. It was my first time in Quebec (the French speaking province of Canada), and my first time in Montreal. I fell in love with the city and its charming and unique character, but in particular I loved all the street art that I saw. This piece is on Rue St. Denis along the side wall of the Hotel Castel St. Denis. 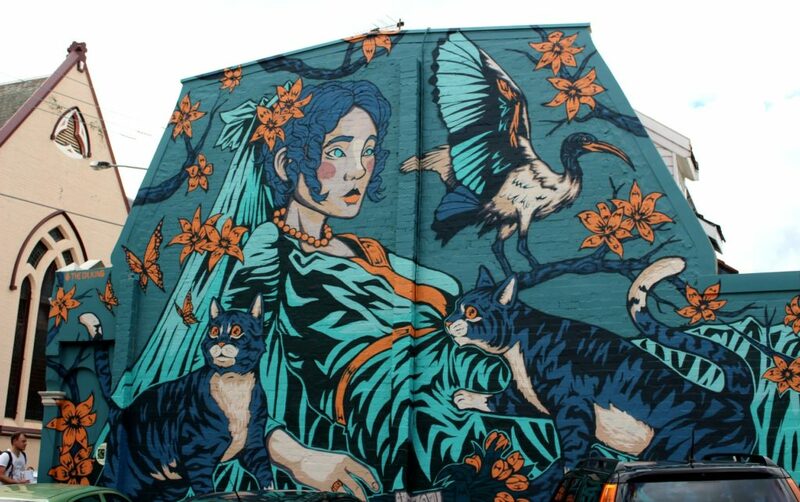 It is one of many works of street art in Montreal created by the artist Labrona. Our favorite spot for street art has always been the Mission District of San Francisco. The street art scene is defined by more than graffiti and simple tags. Instead, street art in San Francisco is about murals of social and political importance and great works of art. The pieces carry more weight than their temporary canvas would suggest; they instigate change, and give San Francisco its urban character. Take a street art tour in the Mission here! Every city in the world is blessed to have an abundance of street art and Memphis, Tennessee is no different. Whether you consider street art to be a “work of art” or have a negative perception, it’s a reality we all should face that those creating these masterpieces really do have skills that should be embraced. Memphis is a city that epitomizes multicultural integration and this is certainly depicted through the amazing street art throughout the city. 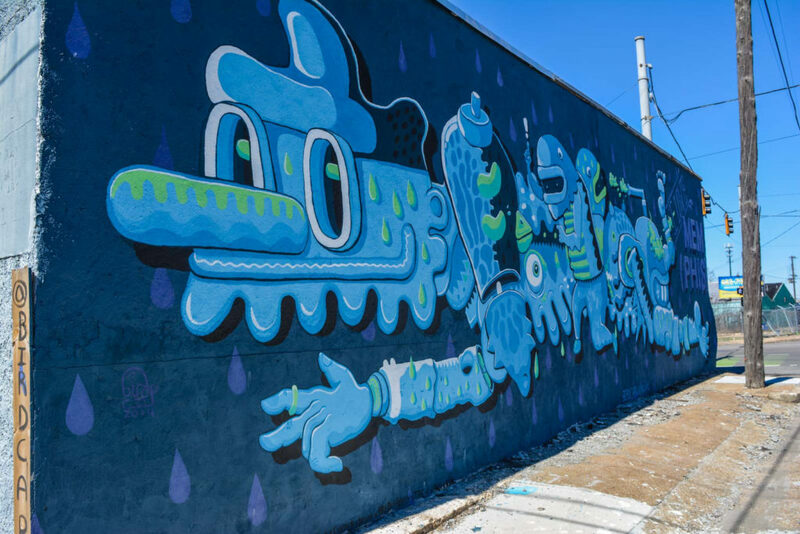 Whether you are admiring artistry emphasizing passion for the city, such as “I Love Memphis” or simply a mural that offers a reflection on Memphis’s history, there is plenty to experience both in the downtown vicinity and surrounding neighborhoods. Overton Square is a trendy location offering boutique stores and lively bars, so it’s no surprise to see vibrant, colorful street art that offers a great marketing tool for the local area. South Main Street is an iconic part of Memphis, primarily given its location as the home of the National Civil Rights Museum. A stroll along South Main will lead visitors to the Lorraine Motel, site of MLK’s assassination so street art here is undoubtedly focused on promoting the sense of equality. Memphis has so many amazing street art examples that makes it almost impossible to pick a favorite. We always encourage people to step “off the beaten path” to stumble across new forms of street art because you never know what amazing underlying stories you will discover. Fremantle, a historic port town just south of Perth in Western Australia, has some fantastic street art, and it’s fun to wander taking in the local creativity on display. We found no street art more impressive than the incredible fresco on the outside wall at East West, a funky furniture store in a warehouse in South Fremantle. 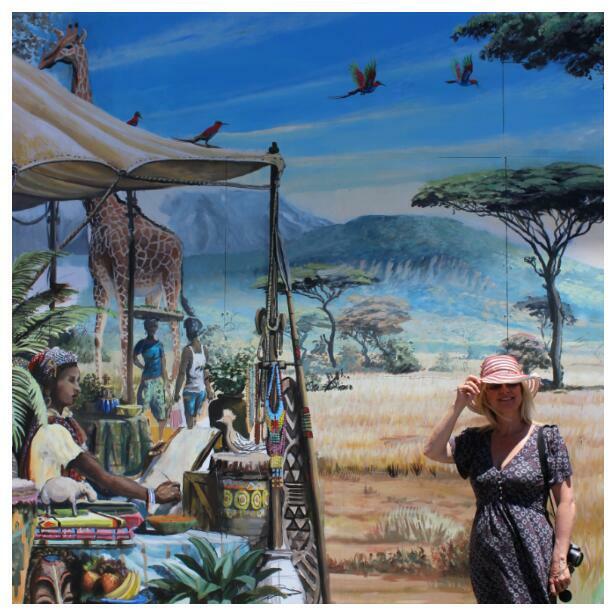 The mural was created by artist Graham Richards and it covers the entire length of the East West emporium – more than 100 meters in length and depicts beach scenes, exotic shops fronts with Asian and Parisian overtones, other European and Middle Eastern designs, as well as a scene straight out of Africa. I love it! Street art really makes a city for me. Thanks for featuring us AND adding to my ever growing list of places to visit. I totally agree! Thank you for your awesome contribution, I’m kicking myself for never having visited Austin after checking out your photos! If you love street out check out Getsemani in Cartagena Colombia and Cali in Colombia too! Awesome tips, thanks! I loved the street art in Bogotá but I missed that part of Cartagena and never went to Cali. When I go back to Colombia I’ll check it out for sure! Miami mural is the best! Great idea for a post. Thanks for sharing! Street art is pretty cool. I have seen a few of these places on your list here in the US. It is amazing that you see it all over the world, vary talented people for sure! It’s a great concept to spread around – art for all! Wow, all great cities! Sydney is definitely on my list. I’d include London as well 🙂 Thanks for sharing! London is coming up soon in the Europe-exclusive place 🙂 Check it out, it’ll go live tomorrow! 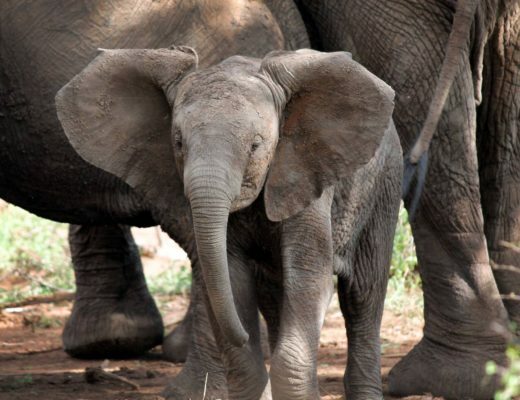 A wonderful post with some great inspiration. It’s great to see that street art is alive and well around the world! Thanks so much for including my offering too. Agree! Thank you so much for contributing! I have seen so much of Malaysias street art lately! Awesome collection! We saw heaps of beautiful art on Isla Holbox in Mexico too! Ooh good to know! I’ve been wanting to visit Isla Holbox so I’ll note that for when I finally make it there. Malaysia is amazing for street art. I went to Penang last year and it was incredible! This is a really great idea for a collab. I Have been to Ipoh and I live in Newtown so this was really fun for me 🙂 I do love the street art in Newtown – might do a whole post on it! Ahh how cool that you live there! You definitely should! It looks so rich for potential. I only went to Newtown at night when I was in Sydney, so I missed seeing the art during the day. Bummer! I love exploring new places and finding amazing street art! I am happy it’s growing in popularity and “legitimacy” now. I haven’t been to most of these places but agree with Cape Town and would add Johannesburg, especially the Maboneng precinct! Pinning for future ref! I totally agree! It is certainly a legit art form. 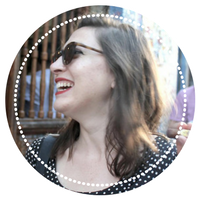 I would love to visit South Africa and see the art in Cape Town and Joburg… ahh, so many places to see! Such a great choice of cities with some epic street art. We love searching for street art when we visit new cities around the world and one of our favourites has to be Plovdiv in Sofia! I am heading to Plovdiv soon! I can’t wait to check out the art scene there. Any specific places you’d recommend for good street art? I would also recommend Infiorata di Noto in Siracusa, Sicily where they paint the street with petals. They do in May every year. That is so cool! I’d love to visit Sicily. Some amazing and BRIGHT street art here. I love seeing all the art and creativity. Thanks for including us. I didn’t know there was great street art in Memphis! I’d love to visit all of these cities. Thanks for sharing! 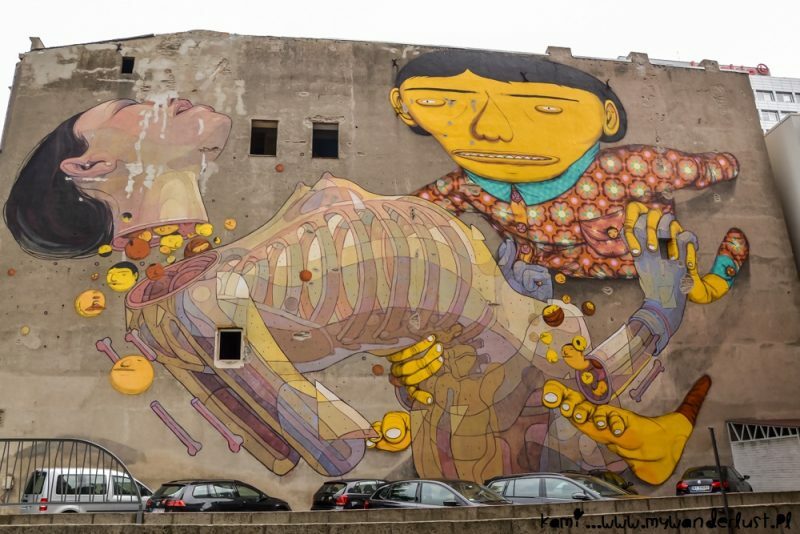 I had no idea some of these cities were known for their street art! And I love street art! Me neither! 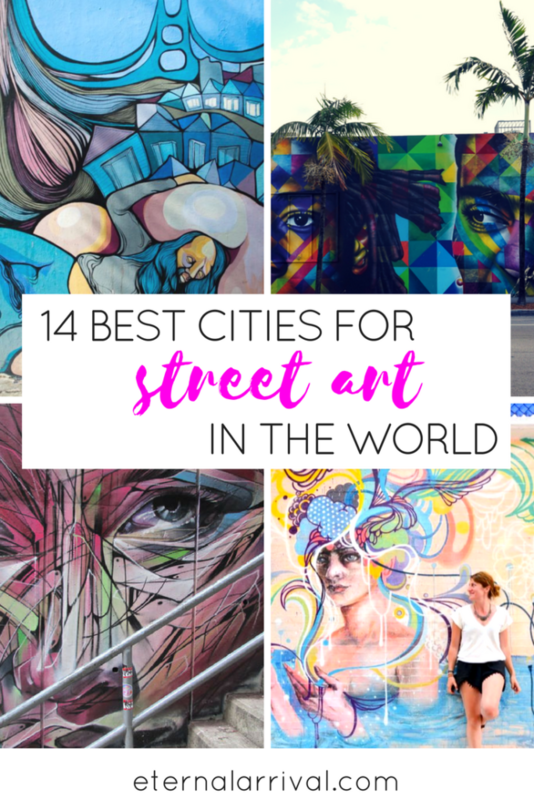 I’m bummed I never explored the street art scene in some of these countries when I visited. Fremantle’s art looks amazing! I’ve really been wanting to explore Western Australia. Enjoy your time there, I’m sure it’ll be amazing! Yes, Penang’s street art is excellent! Such beautiful work everywhere. And such excellent food! I would love some asam laksa right now 🙂 Glad you enjoyed! Thank you! I think I’ll do a follow up one day – I’ll get in touch with you when I do! So many cities with great street art! 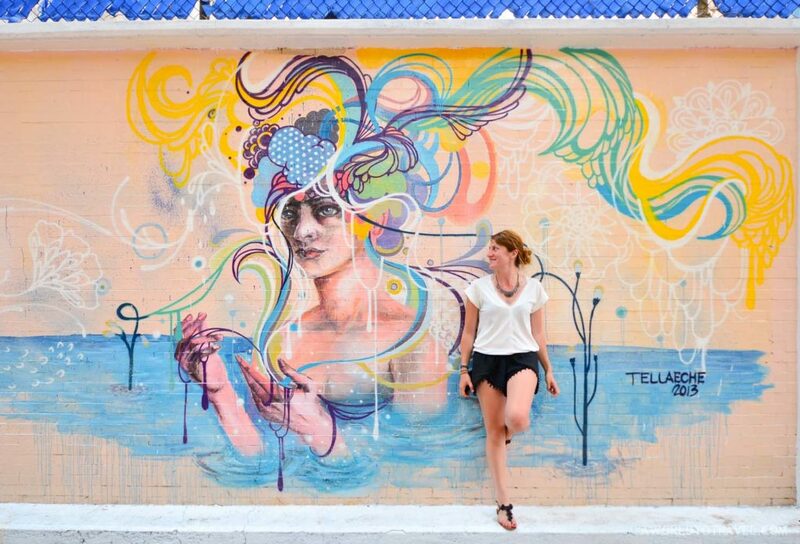 I loved Miami and was inspired there to find more cities with street art. Great list! Street art at San Fransisco, California has a deep meaning one. In my opinion. I love it as well 🙂 Thanks!